Look at that adorable slow mover! 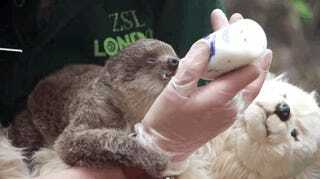 That is little baby Edward, a sloth who needs a lot of help to survive since his mother stopped producing milk. So Zookeeper Kelly-Anne Kelleher and a stuffed sloth toy give him food and love.